A multi-generational family explores nostalgia and togetherness in new holiday spot “R+S”. Recently, Toyota revealed its annual Toyotathon December Sales Event holiday-themed TV spot, “R+S,” featuring a real-life multi-generational family. “R+S” unfolds like a film as it tells a family’s multigenerational story using a much-loved family tree as the centerpiece. 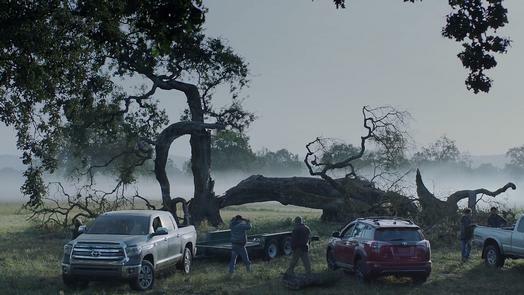 The narrative starts with the grandparents as a young couple and the tree bares their initials, “R+S.” The story continues decades later after the tree has fallen from natural causes. During the holiday season the grandparents visit their daughter’s home to find a framed picture of themselves as a young couple in front of their special tree. As the rest of the family hides in anticipation, they see the inscription of their initials “R+S” on the table and quickly realize it’s their beloved tree. The spot features a real family of actors including grandparents, their daughter, her husband and children. The director, award-winning cinematographer, Lance Acord, filmed in Sonoma, California and cast a family from Santa Rosa. Fostering the true meaning of the holidays, togetherness, Toyota tugs at the viewer's heartstrings by focusing on the family’s story to create a relatable, emotional experience during the hectic holiday season. “R+S” premiered last week on NBC between The Voice and This is Us with the special 100-second version – a first in broadcast history – before moving to top theaters nationwide for in-cinema play from December 1-28. A mix of :30 and :60 versions of “R+S” will air on television December 10-24. The Toyotathon December Sales Event offers incentives through January 2.